CPSP is pleased to announce the initiation of Basic Life Support Program at CPSP, initially at Karachi. The Program has been acquired from American Heart Association and has accreditation from American Heart Association. Worldwide over 40% of all disease burden is due to one group of diseases – the Cardiovascular Diseases. All other disease put together account for less than 60% of the prevalent disease burden of the mankind. Cardiac diseases are the leading cause of death. During 2002, WHO reported through wikipedia 57.029 Million deaths for the year, of which 41.98% were caused by Heart diseases. Another 9.66% were caused by cerebrovascular disease. Ischemic heart disease was the cause of 3,512,000 deaths in developed countries, while in developing countries it caused death to 2,484,000 human beings. In Pakistan more than 50% of deaths in the adult population are due to Cardiovascular Diseases and about 30% of all deaths are due to cardiovascular causes. Heart Disease spares no age. About 1% of all babies born in Pakistan have Congenital Heart Disease. About 5% of school age children have Rheumatic Heart Disease. About 14% adult population of Pakistan suffers from High Blood Pressure (Hypertension) and Coronary Artery Disease (Angina and Heart Attacks). These programs therefore acquire especial importance for the healthcare providers. (Above data provided through the courtesy of Prof. Azhar .Masood A. Faruqi, Director, National Institute of Cardiovascular Diseases, Karachi) Most of the patients of Heart diseases, when admitted to hospital loose their lives within first hour of onset of symptoms. About 90% of these deaths are due to sudden cardiac arrest secondary to ventricular fibrillation. Basic Life Support has been developed by the American Heart Association (AHA) to enhance the skills of the attending doctors in treating the victims of cardiac arrest and choking. It helps to recognize ventricular fibrillation which is by far the most common arrhythmia causing cardiac arrest. Basic Life Support Program focuses on (CPR), i.e. Chest Compression and ventilation. Video based Practice While Watching reinforces the concepts of proficiency in basic life support skills. Cardiac compressions for adult, infant and pediatric. Correct technique of ventilations using Ambu bag and adjunct devices. Relieving chocking in all age groups. BLS manual needs to be comprehended before participation in the course. A candidate who has not received his manual at least couple of days prior to the course is recommended to wait for the next course. Dressing during the course should be comfortable for the practicing CPR skills over the mannequins lying on the floor. The course is designed for everyone including healthcare providers. BLS course duration is of 4.5 hours with 04 CME if Pass. 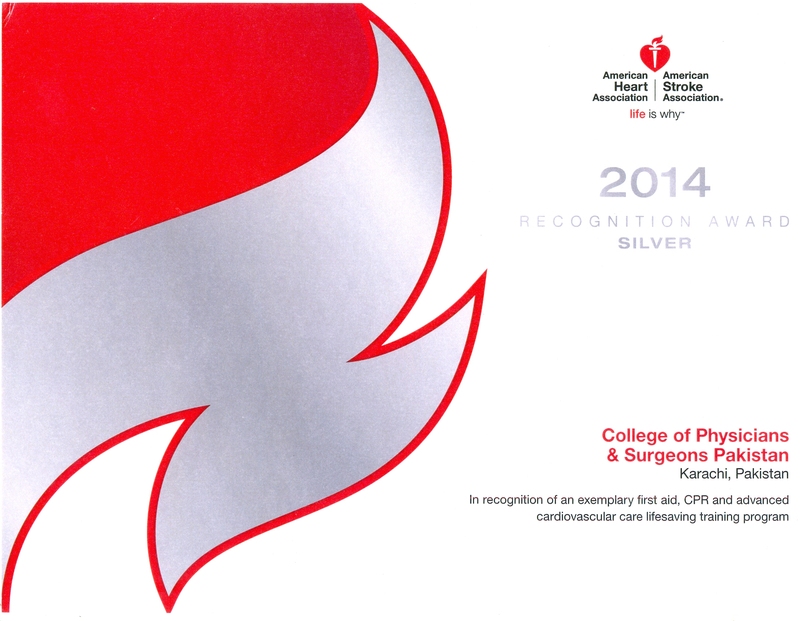 American Heart Association completion card and acknowledgement from CPSP. Post course written test with passing (closed book test). CPSP shall award certification to the successful candidates which is accredited by the American Heart Association and accepted by all the countries which have adopted AHA based Cardiac life support training as a policy. The certification is valid for two years and is required to be renewed by participating in a one day renewal course.